French Mountain Bread for sale. Buy online at Zingerman's Mail Order. Gourmet Gifts. Food Gifts. The traditional peasant bread of France. 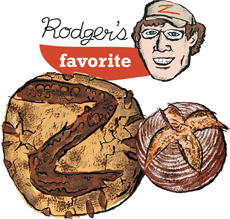 Rodger Bowser is a managing partner and the head chef at Zingerman's Delicatessen. Hands down, this is my favorite bread and probably my favorite food period. It is my desert island food for sure. I love it for just eating, salami sandwiches, grilled cheese and breakfast toast with tons of butter and preserves. This bread is so good with a fried egg on it. The big loaf holds well on the counter all week till you can get another one. How could you not like a loaf designed to sit around and get better? I’m amazed that we sell it for less when it's “day old” at the deli—we should charge more for it after a day! It has been the only bread in my stuffing for the last decade during Thanksgiving where it blends well to the sausage, celery and sage. We offer this bread in two sizes: a .75 kilo loaf (about 1.65 lbs) that’s good for munching and a two kilo (about 4.5 lbs) work of art. Both are made with organic wheat flour.